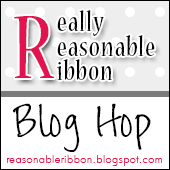 We have a Spring Fever SALE going on this week at Really Reasonable Ribbon. Stock up now and save! Click HERE to pick up sale codes. Today you will see some great projects using our March Ribbon Club Assortment from our very talented design team. They always come up with some super ideas. At the end of the hop, comment on this post answering the question below for a chance to win our March Ribbon Club assortment shown below. Do you think blogging is losing it's appeal? Do you still visit blogs on a regular basis or do you find yourself on FaceBook or Instagram more often to follow your favorite artists or companies? Our winner will be selected from the numbered comments on this post on Friday, 3/17. Be sure to check back on Friday evening to see if you are our lucky winner. I still prefer to visit blogs. I feel like blogging still has the personal feel to it, where FB and Instagram are for the mass appeal. I am more of a private person and don't always want to respond to things on social media. I still visit blogs daily. I prefer blogs over fb or instagram. Fabulous hop! Very much prefer Blogs over FB or other social media. I love commenting on personal blogs and will very rarely comment on social pages. I definitely prefer the blogs. I visit IG daily, but prefer to get my inspiration and such from the blogs. Facebook, I can take it or leave it. I skim a few pages there, but not much else. I love blogs and am disappointed that people don't have them to see how they made something!! Love inspiration from your very talented designers!! I love blogs! I am not on Facebook and I haven't got the hang of Instagram yet. I am very comfortable visiting blogs and enjoy all the inspiration and information. I like to visit blogs more. I am not as big a fan of social media. I love and still regularly visit blogs. Although I use Instagram and Pinterest for visual inspiration, I almost always go to blogs to learn and keep up with the blogger's latest news. Love this pretty Spring Rainbow assortment! I still like the blogs! I do look at Facebook but I have no way to sign up with IG since I don't have a smart phone. I wonder if folks just find it easier to post on Facebook. The writing is short and you have a photo. Quick and easy. Your rainbow colors ribbon assortment for this month is lovely. If I didn't visit blogs, I wouldn't even know about it. I don't do Facebook etc. so I find blogs my greatest source of crafting inspiration, info on new releases. . .and I enjoy the blog hops, too! I never visited a lot of blogs to begin with so hard for me to say. I think facebook is easier to see and visit and follow personally. Lovely designs by your team this month.